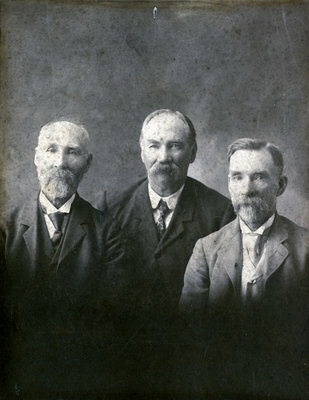 Photograph of the Smith brothers. From left to right: Charles William Smith (b. 10 Nov 1833, d. 21 Oct 1922); Thomas Henry Smith (b. 8 Aug 1836, d. 1 Nov 1911); and John Lawrence Smith (b. 11 Oct 1838, d. 24 May 1928). The Smith family settled in Whitby at lot 21 Broken Front Concession in 1831. When William Smith, father of the brothers, died in 1859, the lot was divided between Thomas and John, while Charles settled on a farm in Darlington Township.